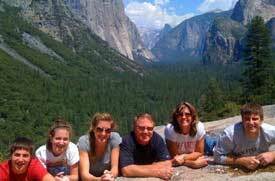 Yosemite Private Tours now offer this Yosemite 1-day 12-hour custom tour, when departing from San Francisco Bay Area. Book our 1-day private Yosemite tour to discover Yosemite National Park natural wonders- the crown jewel of California. 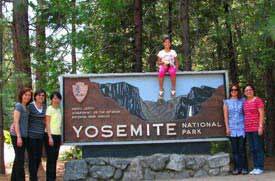 Experience the best custom day tour to Yosemite National Park in a luxury vehicle with a private local tour guide. On the way you will have a chance to capture unique sights and visit Yosemite’s top attractions including the Yosemite Valley waterfalls, Merced River banks and meadows. Hike or walk with your private Yosemite tour guide and picture unique and massive granite monoliths such as El Capitan and Half-Dome, which rises thousands of feet above the ground. For rock climbers, these are some of the most difficult and challenging rocks to climb. If you are staying nearby Yosemite National Park area, the tour length will be adjusted accordingly. The Yosemite 1-day private tour is limited to the Yosemite Valley sights and attractions, which represent only 1% of the Yosemite National Park. Departing from San Francisco, this private tour requires about 10 hours driving, round trip, which leaves you with very little time to enjoy this huge national park in such limited time. The 2-day adventure on the other hand, covers most of the Yosemite’s popular and hidden sights, including the Yosemite Valley wonders, ancient groves of giant sequoias, and Glacier Point - the most spectacular vantage point in the Yosemite. You will also explore beautiful meadows, lakes and hike to more remote areas. These sights and superb views are not available on the 1-day tour. Discover Yosemite’s iconic sights and hidden wilderness – This 3-day custom adventure is a must-do! 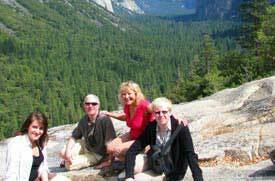 Unlike the 2-day private custom tour of Yosemite National Park, the Yosemite 3-day private tour gives you an extra day to explore Yosemite National Park’s famous attractions and hidden sights. You will be amazed by its beauty and untouched wilderness. Yosemite National Park is the crown jewel of California and one of the top 10 must-see National Parks in the world. The 750,000 acres of soaring cliffs, cascading waterfalls, and lush meadows make Yosemite one of the world’s natural wonders – a park larger than the states of Rhode Island and Delaware combined. Yosemite National Park is a very popular destination for vacation where geologists, biologists, nature lovers, photographers, hikers, rock climbers and travelers from all over the world meet. This 4-day Yosemite private tour package by luxury vehicle, with a dedicated private and professional tour guide, is the ideal outdoor adventure getaway from the busy areas in Yosemite Valley. We will take you away from the large bus tours and crowded sites to explore the Yosemite National Park’s high country, stunning wilderness and alpine vistas. The famous and hidden gems of the Sierra Nevada high country are nearly inaccessible to large vehicles, but our 4x4 luxury SUVs will take you off-the-beaten-path to admire the real alpine vistas, stunning wildlife and a wide array of wild flowers, unique geological sites, hidden overlooks, hikes and waterfalls, granite domes, picturesque meadows and ancient trees. This is a bucket-list adventure we highly recommend to nature lovers and photographers. This private custom tour by luxury 4x4 SUV or large deluxe van, is guided by a very knowledgeable tour guide who is highly rated on Yelp and Trip Advisor. Visit iconic sights, parks, museums and hidden natural wonders, including but not limited to: Hetch Hetchy Valley, Yosemite Valley, Yosemite groves of giant sequoias, Vernal and Nevada falls, Glacier Point, a guided tour to the Tuolumne Meadows in the High Sierra Nevada Mountains. Enjoy an authentic outdoor experience and admire handsome waterfalls and mountain vistas along with side trips to some of Yosemite National Park’s highest peaks and majestic wilderness. Capture the unique beauty of the high-country and stunning alpine lakes including Tioga Lake, Tenaya Lake, Ellery Lake and Tioga which towers above 9,943 ft. These back roads offer magnificent views of picturesque meadows, rivers, waterfalls, massive granite domes and spectacular fauna and flora. We will assign an expert tour guide for photographers and hikers. If you wish to be driven around without hiking or walking, our 4x4 SUV tour will take you anywhere you want, including hidden groves of sequoias and remote sights and alpine lakes. This is the ultimate getaway and thrilling eco-adventure. Enjoy a private guided tour of Yosemite National Park wilderness - the crown jewel of California’s national parks – and a perfect escape to discover the Yosemite National Park and Eastern Sierra Nevada Natural Wonders your way. You will marvel at the world's most iconic sights, including the oldest living trees on earth - the 5000-year-old ancient bristlecone pines that proved all biologists wrong about survival and longevity at such high altitude (over 12,000 ft). You will also hike to a majestic grove of the ancient sequoias, the largest trees on earth. Witness stunning mountain views such as Glacier Point, but also the majestic Tuolumne Meadows and its alpine lakes and hidden waterfalls. You will discover the untouched ghost town of Bodie and visit striking geological formations in Eastern Sierra Nevada like Devils Postpile National Monument, Hot Creek hot springs, and to Rainbow Falls. Capture superb and stunning views of the majestic Sierra Nevada mountains that loom thousands of meters over the scenic open roads of the Eastern Sierra Nevada. Admire the Sierra's massive walls of granite, ancient volcanos, dramatic landscapes, scenic rolling foothills, open ranges and much more. This is a bucket-list adventure and a must-see. Join Yosemite Private Tours to explore in depth the wonderlands of Yosemite National Park, Eastern Sierra, Mammoth Lakes and Lake Tahoe. In winter, Yosemite National Park and Lake Tahoe offer magical landscapes with breathtaking sceneries like nowhere else on earth. These outdoor adventures and private tours are available from November to April. You can also add more sites to your trip, combining unique destinations such as Lake Tahoe, Mammoth Lakes, June Lakes and Eastern Sierra. Yosemite National Park is a magical wonderland in winter. With the summer crowds gone, the park is covered in a white blanket of snow, contrasting the light blue skies. Winter makes Yosemite and Lake Tahoe magical vacation destinations for the entire family, nature lovers and photographers. The notion of solitude, incredible silence and striking beauty of Yosemite wilderness in winter, makes this a bucket-list adventure and a must-see destination for all ages. Experience one of the most thrilling whitewater river rafting adventures in California. The ideal getaway outdoor adventure for the adrenaline junkies. Join Yosemite Private Tours to experience the thrills and excitement of this new whitewater rafting, day tour package in the Sierra Nevada wilderness. Prepare yourself for an 8 to 10-mile rafting experience on the American river that flows through the Sierra wilderness. This exciting river rafting trip offers class III rapids and is accessible to beginners and intermediate paddlers alike. Visit the legendary Alcatraz island and its world-famous prison. Our Alcatraz tours are combined with daily private guided tours of San Francisco’s iconic monuments and attractions, Silicon Valley tech tours of the tech companies such as Google headquarter, Apple, Stanford university and Facebook. We also offer day excursions to Monterey, Carmel-by-the-Sea, Big Sur, Hearst Castle, as well as getaways to Napa Valley and California Wine Country, Redwood National Park, Muir Woods and Point Reyes. Other activities and custom tours include seaplane and hot air-balloon adventures, and horseback rides on the beach. Magical & Majestic-believe every good thing you read about this tour company, you will not be disappointed! Our Bucket List Overflowed, a wonderful day in an amazing park with the perfect tour guide! Breathtaking adventure in Wonderland, found on Trip Advisor & we were not disappointed! Treated like King & Queen! Breathtaking, OUTSTANDING and A MUST See!! Without any hesitation, 5 stars! A wonderful day in Yosemite National Park wilderness, totally exceeded expectations! The best experience ever! They are consummate professionals who really care about their customers' wellbeing and experience- a must do! Impressive! Their Ability of organization, understands, customize, entertain, and educate: unforgettable experience! A Once in a Lifetime Experience, A Must Do! Don’t think twice, trust them and you will not be disappointed!